Over the past couple of days, you may have seen clips of Snoop Dogg streaming on Twitch, enveloped in a cloud of marijuana smoke. Typically, that kind of behaviour would get you banned from the platform, and your stream pulled down. Just a friendly reminder that Call of Duty: Ghosts had marijuana-themed content and a Snoop Dogg announcer pack. Yet Snoop’s stream, a promotional broadcast of the game SOS, stayed up, with around 80,000 viewers for the duration. Twitch’s community guidelines say that “any content or activity featuring, encouraging, or soliciting illegal activity is prohibited,” as is “self-destructive behaviour,” including “the use of illegal drugs.” So how did Snoop get away with it? 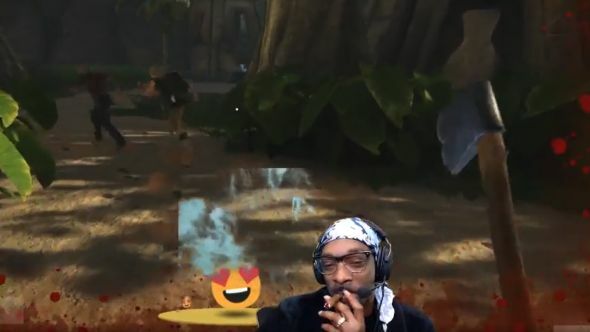 Slightly more awkwardly, it seems that while Snoop was perfectly within his rights to smoke on stream, he might not have actually been playing the game. Another redditor captured this clip of Snoop lighting a spliff while his character visibly moves around on the stream behind him.